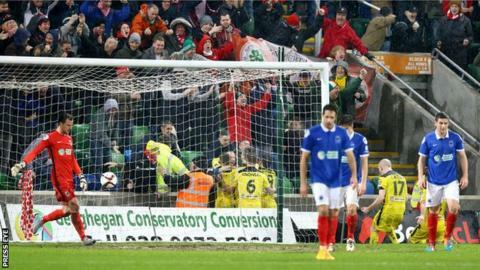 Cliftonville are set to make a complaint to the Irish FA and NIFL over health and safety conditions at Windsor Park for their game against Linfield. The club also intends to "address the issue of Domestic Licence requirements evidently not being met" at the ground, where redevelopment work is continuing. "Entrance and exit routes provided for our fans fell quite some distance below expected standards," said Cliftonville. The Reds secured a 2-1 victory in Saturday's Irish Premiership match. Northern Ireland played Latvia in a friendly at the national stadium less than 24 hours before the club encounter. "We will be making official representations to the Irish Football Association and the NI Football League about our supporters' dissatisfaction with the facilities," the Reds added. "We reiterate our understanding that Linfield, as the host club, have experienced difficulties of their own during ongoing building works at the venue. "But, having been advised of a lack of basic amenities for our playing staff in addition to our supporters' health and safety complaints, we feel it necessary to bring the matter to the attention of the relevant authorities."